A very tepid game that relied on marketing and shock-value to sell itself. Don't let the hype fool you: there is no great story about racism, nationalism, or religious extremism to be found here. It is all wiped away by a contrived story that seems to think that shocking is smart. It's gameplay is not great either. It combines several different shooter ideas without understanding the strengths of any of them. It has decent visuals which are well-stylized, that's all I can honestly praise. It's like Infamous with an anti-Libertarian agenda. The gameplay and story have about as much to do with each other as Australia and Pluto. Exceptionally pretty but hobbled by uninspired gameplay and dreadful politics. This was supposed to be an improvement over the previous games, but I just found it dumb as hell. Bioshock Infinite does what a video game sequel should. Retains the game play we've grown to love about the originals and injecting it into a new world, new characters, new story, and a total reversal of atmosphere. Bioshock Infinite is grand. Just grand. It took excellent gameplay mechanics and transported them into an equally, if not better-utilized, world. And the world truly is something else. I found it more interesting than the dark underwater city, and the same goes for the story. When the twists come, they're some of the most dramatic and engaging story turns I've ever experienced in a game. Not as good as the first 2 Bioshocks but a good game. 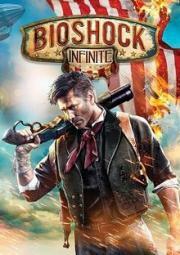 The final installment of the Bioshock franchise, BS: Infinite took a risk by going above the clouds rather than below the sea. Gorgeous visuals and a smoother gunplay system made for an excellent title that didn't quite capture the wonder of the first title, but still served to make an excellent game. After listening to the presenter babble on and on about something incomprehensible, you're finally let into the shooting gallery, only to find yourself out of ammo. That's how to make a game feel infinite.